“The editor’s pick this year singularly, unabashedly falls for Stella Velon’s The Critic, worth every minute of the short! 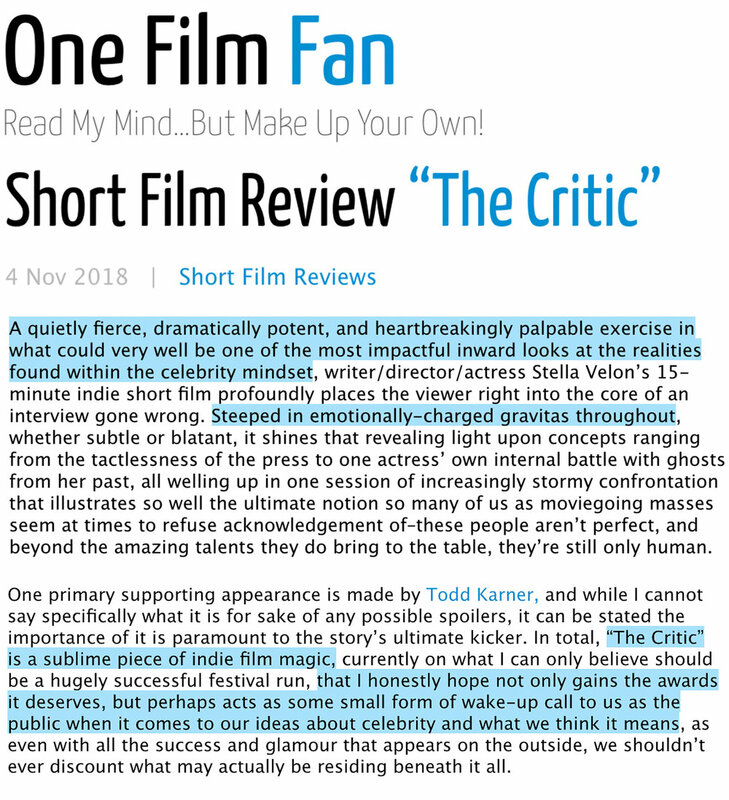 “…writer/director Stella Velon's emotionally involving and thought-provoking short film The Critic continues on what should most assuredly be a successful run through the indie fest circuit. The Critic is nearly instantly engaging and a remarkably poignant story that somehow manages to travel a broad emotional spectrum while delivering a complete story within its modest 15-minute running time. The heart and soul of the film is unquestionably Velon, who manages to convince as both a confident, award-winning actress and as a young woman with a fragile facade... It's powerful, disturbing actually, to watch Velon's entire being shift throughout the interview - her language, her facial expressions, and her body language all revealing every little transition in subject and tone. The acting is astute, and both Velon and Alan Smyth… turn in wonderful performances. …a scene with director Velon… is the film’s most powerful. It requires a terrific physical performance of tears and pain from Velon, and she delivers… the pain – both psychological and physical – is palpable, and Velon (through her direction and acting) makes us feel it. All-in-all, The Critic is a good production that involves the audience directly in the picture. It’s painted with vibrant colors, has a solid intention, and delivers on both fronts of cinematography and acting. It’s easy to follow, watches quickly, and has a soundtrack and score… that are immediate and powerful.